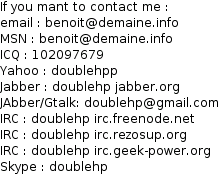 I want to perform a DHCP querry manually. I want to simulate a DHCP request to a specific DHCP server, but not use any of the returned values. dhclient -n should theoretically do it using the ISC client, but in practice, the command does not work for me. So I need any alternative to do it. Netcat scripts are welcome. Never used it, no clue where to start. Other approches accepted. I want to check the DNS. But not use them at once. The IP of DHCP server is fixed and known. dhcpcd has a "--test" option, which should do what you want. You don't generally do a full DHCP transaction to a specific server - the only time DHCP unicasts is during the RENEW phase. Otherwise, as said above, dhcpcd --test should fill your needs. Yes, dhcpcd --test could do it, but on the machine where I need it, i can't install dhcpcd. I have found an other way to do it, via heavily altering the conf files /etc/dhcpcd.conf and friends.